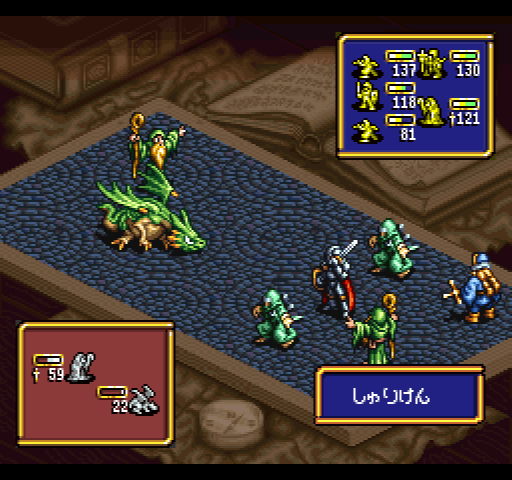 This is a familiar sight on the PCE side of this blog, another fairly standard RPG that follows the Dragon Quest model closely. 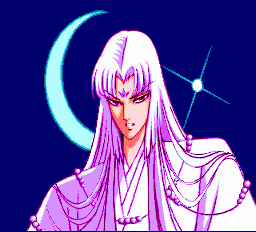 Out of all of these that have some along, I still think Tengai Makyo is the best. This game has pretty much everything you would expect from this area -- few strategic options in combat, very limited inventory, and primitive interface. 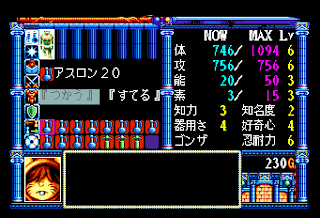 The leveling is faster than other games and there's a run button so it plays more quickly -- also you can hold down the button to keep choosing attack, which, coupled with the emulator speedup, makes fights go very quickly. 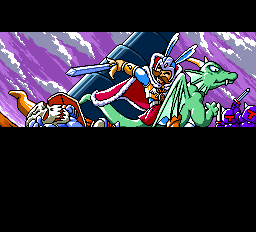 The main feature of this game is the dragon, which I'll say more about as I describe the game. The opening scene is accompanied by voice acting, pictures, and slight animation. We learn that a comet has come to this planet and then monsters arose, headed by Dark Emperor Geel. The Monbit tribe opposes Geel but they are all killed except for one baby (Kurisu), who gets taken by a priest to a small village to grow up. Of course this is the hero of the game -- this plot is pretty cookie cutter. You have to go around to five continents to find five fragments of a Monbit Seal, which will help the last dragon grow up. 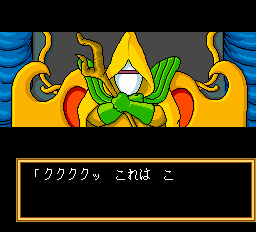 The final boss seems to be Geel, so there aren't any big twists. At first the dragon is just an egg, which consumes a spot in your very limited inventory (along with a letter from Kurisu's father). Adding in 5 pieces of equipment, that leaves very little space for anything else. The combat system is your standard "hold down attack until the enemy dies" style. MP are very limited so you have to save it all for healing. Thankfully dying just takes half your gold, so you can progress quickly through the game. 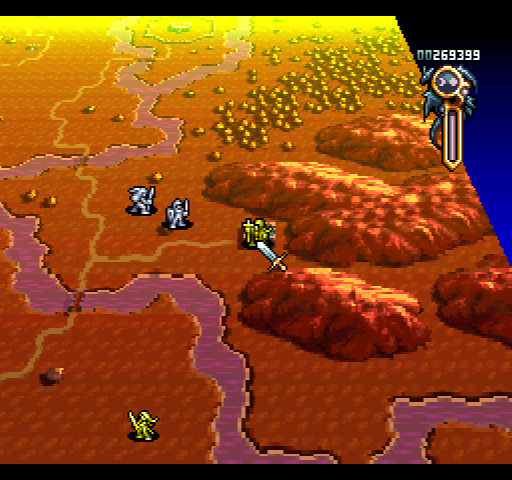 The battle scenes are pretty boring, with no background and little animation except for the bosses. 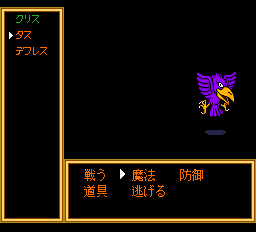 The monster designs often seem inspired by Dragon Quest, although not quite with the charm of Toriyama's monster designs. 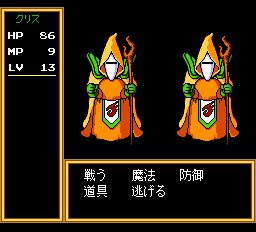 The spells also have nonsense names; another Dragon Quest-inspired feature. 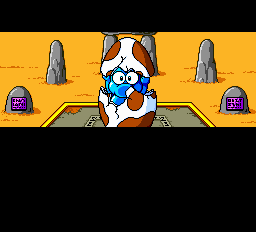 After grabbing the egg, it's time to hunt down the first of Geel's five underlings, who will have the first fragment of the Monbit symbol for me. Immediately the area grows dark. Kurisu must recover a stone statue from a boss in a cave that restores the light to the area. As you may be able to see from some of these pictures, the world design is interesting. Rather than humans, there are these animal-humanoids. Some are piglike, some doglike, etc. The Monbit clan is apparently bunny-like. Once Kurisu restores the light, a few more fetch quests brings him to the castle where the first major boss, Eroe, resides. 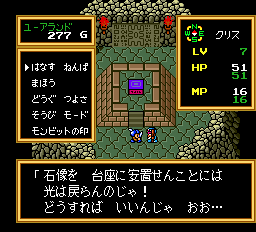 There's nothing special about the dungeon, and Eroe himself is not very hard. It's a common quality of these games that the random encounter rate is so high that you have to be pretty strong just to make it to the boss, and by that point the boss is a pushover. Once Eroe is defeated, Kurisu gains the first fragment of the Monbit symbol. I returned to a shrine and placed the egg on the altar, activating the symbol. The egg hatches, and I have my dragon. 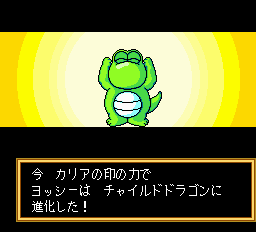 Unfortunately the dragon is just a baby and can't fight, although he gains levels. I named him Yoshi. However, as a baby he is often hungry. He emits high pitched squeals constantly, and the random encounter rate goes up. You can stop this by giving him milk, but the effect barely lasts any time, and inventory space is too limited. So I just muted the sound and ignored him -- this would have been far more annoying if I weren't emulator-speeding through battles. The tiny dragon is able to open a door that was blocking me from accessing the second continent. 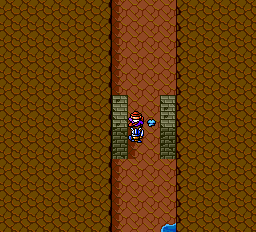 Here, the pattern is basically the same as the first -- I had to find a statue in a dungeon to stop the lava that had flowed over the whole land. 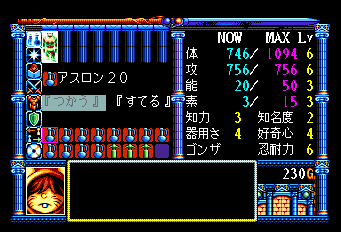 Somehow the towns instantly revive after that, and then I was able to go to the next boss' castle. Because of the encounter rate with Yoshi, by the time I reached the boss I was so overleveled that his attacks all did 1 damage, and he was very easy to beat. Now with the second fragment of the Monbit seal I can grow the dragon to a child, and he can fight. At this point I can also start feeding Yoshi fruits and then choosing various attributes to put points into, which will affect the skills and spells he can use. This is where I stopped playing. The dragon system is interesting, but isn't really enough to make up for the generic mediocrity of the rest of the game. I played about 4 more stages of Ogre Battle since my last update, but I think I'm going to move on. I could have skipped the game completely since it came out in English, but since it's such a highly spoken-of game and I enjoyed OB64, I decided to give it a try. I'm not enjoying it that much, though. The main problem is that the stages are too long and have too many enemies in them, and there seems to be little in the way of viable strategy other than holding in one place and waiting for all the enemies of the stage to come. If you kill the leader then you'll have to fight the unit again (unless you can manage to get a flying unit behind them to pick them off). I tried using other strategies and trying to play more quickly on the stages but the result was always my towns being recaptured or units killed. Then there's the alignment and Chaos Frame (reputation) system, which are interesting but not very well implemented. The things that make you gain and lose alignment (and CF) seem to punish you for playing the game normally, and require you to jump through a lot of hoops just to keep a consistent alignment and CF, much less what you need for the best ending. I can definitely see why people rate this game so highly. 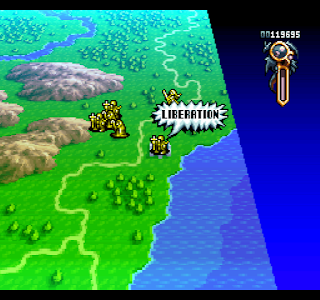 You can do a lot of customization with your units and squads, and the multiple endings make the game very replayable. You can rush through the game, or you can really take your time and try to get every optional character and event, and the best ending. So even though I'm moving on to the next game I would not necessarily rate this game below average. With some of the other games like Light Fantasy the game is just garbage, but with this game I think it's a pretty decent game that I just personally don't like that much. Rather than spend weeks going through the game it's probably better for me just to go to the next game. 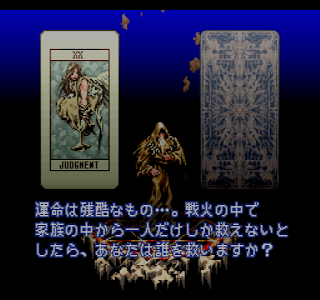 The general purpose of this blog is to play games that weren't released in English. However, the secondary purpose is for me to have fun, so I will be playing some games that were released in English that I never played when they came out. Other than this, I will at least be playing the two Breath of Fire games, Super Mario RPG, and Lufia II. It's also possible that I will replay a few classics that I have not played in over 20 years since they first came out -- Secret of Mana and Final Fantasy VI, for instance. But I'll decide on a case-by-case basis. 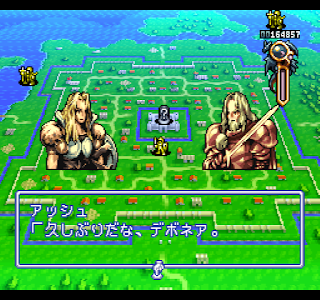 This game has a lot of titles: on the cover of the Japanese box, the top is 伝説のオウガバトル ("Legendary Ogre Battle"), followed by Ogre Battle in English. 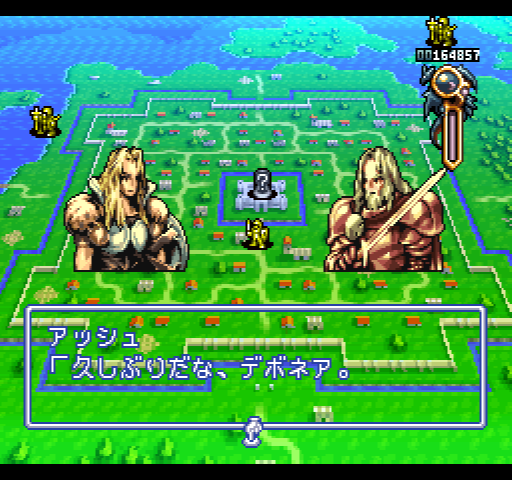 Then "Ogre Battle Saga: Episode Five, March of the Black Queen." This "Saga" would later have episodes 6 and 7 (Tactics Ogre and OB64) and two side games, but nothing more. 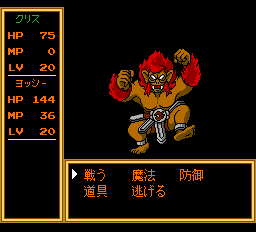 Both "Ogre Battle" and "March of the Black Queen" are songs by the band Queen, incidentally. 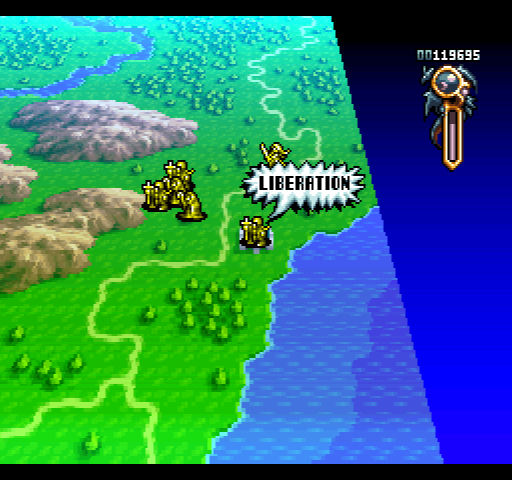 This is a real-time strategy SRPG. It does qualify as an SRPG in my criteria -- it has a narrative rather than just a goal, and individual named characters that can be developed. Normally when I play an SRPG I use walkthroughs for factual information like how to get a good ending or optional characters, but I try to figure out the strategies myself. That's what I'll do here; I'm going for the best "World" ending. 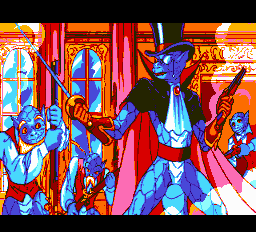 There's nothing much to say about this stage since it's just a tutorial for moving; Warren and Lancelot join your party. I answered the initial questions honestly and ended up with (I think) the Iainuki Lord, who has a strong attack from the back row that hurts her as well. This is the first actual stage. 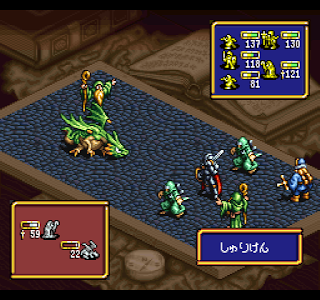 You have squads of up to 5 characters, although large units like dragons take up 2 spaces. 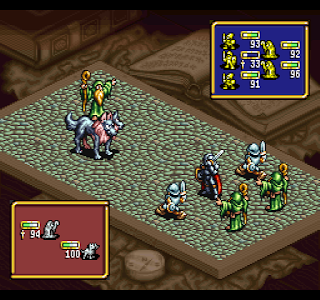 The units have different attacks based on whether they are in the front or back row. Each unit has a leader, and if the leader is killed then the unit has to run back to the home base and leave the stage. 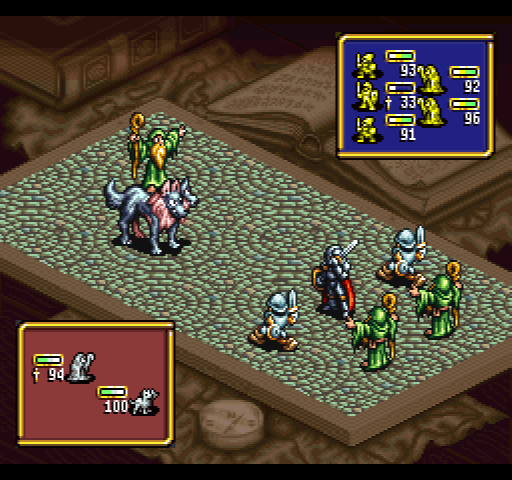 When a battle happens, the squads don't fight to the death, but only until each unit does a certain number of attacks. Then whoever did more damage is the winner, and the loser gets pushed back. 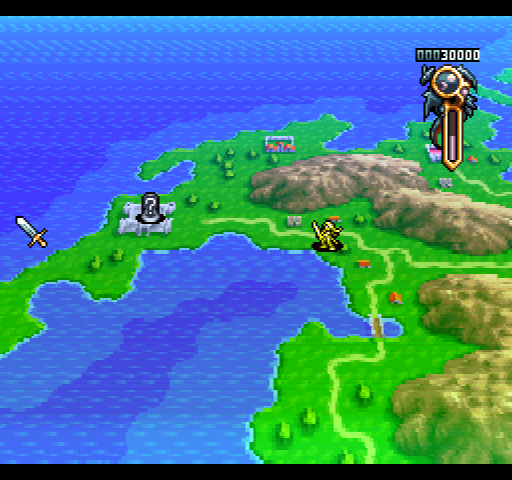 The goal usually is to liberate as many cities and temples as you can, and then defeat the boss. 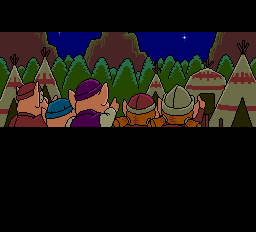 There are hidden items and towns on the stage -- here one of them gives you an item (the Twinkle Star) that is apparently necessary for the best ending. There are two things I find disappointing about the strategic elements of this game. The first is that the enemies all tend to just gang rush you, meaning that a lot of the time you just have to sit and wait for them to come until they're all gone, then you can actually move around the stage liberating the various towns and things. The second is that if the leader is killed, the enemy will flee back to the base and then immediately return with a new leader. This means that a lot of your strategy has to be exterminating the squads rather than just killing their leader, unless you want to be killing the same squad over and over again. 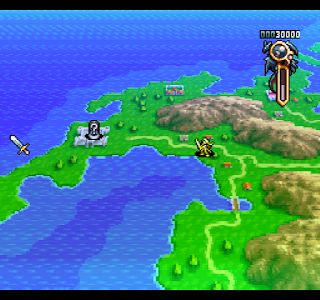 This stage has two additional optional characters, Canopus and Gilbert. 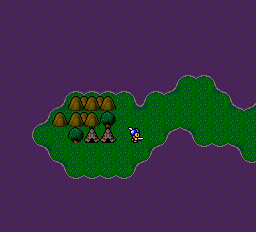 Canopus just requires going to several different towns on the map, but for Gilbert (who is the boss of the stage) you have to forgive him. Also, your Chaos Frame has to be high enough. The CF (called "Reputation" in the English version) is an important value that's shown on a meter -- it affects things like secret characters and your ending. Keeping it high mostly involves using high alignment units to liberate towns, and avoiding "incorrect" answers to questions and such throughout the game. 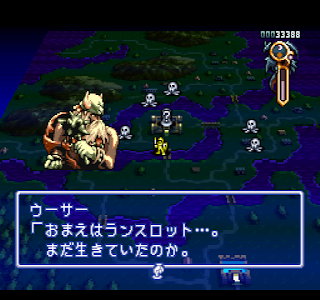 This stage has the first undead enemies. These guys are annoying because they can't be hurt except by a Cleric or similar class. The Cleric has to use healing on them to instantly kill them, although it can miss. Fortunately it hits all the undead with each single healing spell. This stage has a werewolf, but as long as you go fight him during the day he's not very hard. Deneb has been in all the Ogre Battle games, I think. 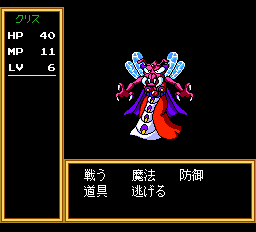 Here she's the boss, and to be able to recruit her you have to forgive her, taking a Chaos Frame hit. I decided not to do so, even though it's fairly easy to recover CF over the medium term. I just figured I would play it goody-two-shoes all the way. This is the longest stage so far. 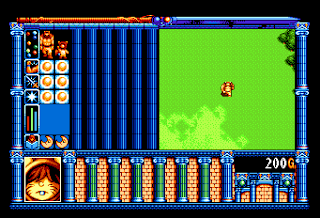 The boss is protected by big walls that block all non-flying units. Making flying units in this game is not as hard as in some other games I've played because a single flying unit makes the entire squad flying. So at this point most of my squads have the flying unit -- they can move faster and cut off retreating units, as well as ones that have lost their leader. There's an item, "Trojan Horse," that can break down the walls (changed to TERMITES in the localization...for space reasons, I guess?). But if you do that more ground troops come out. I did it anyway, and this was the hardest boss so far -- bosses in general are tougher because they regenerate HP very quickly and can instantly replace killed units in their squad. I had four units beating up on him and made sure to use the "spread attacks around" AI to avoid killing them. I do have to say that I've found all of the AI options useful at various points in the stages, which is good. Another area that's lacking so far is the story; there is some, but a lot of it is just "here's the next place to liberate." 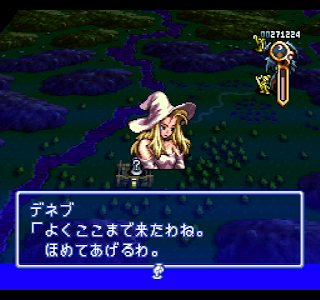 This is a familiar theme in this era of games: originally a game released for several different computers, then ported to several consoles (PC Engine, Super Famicom, and Sega CD). However, it was released in two parts and only the PC Engine got both parts ported. It has a common feel to these kind of RPGs -- it's not a Dragon Quest clone and has a lot of odd aspects to the system that set it apart from the original games for the system. 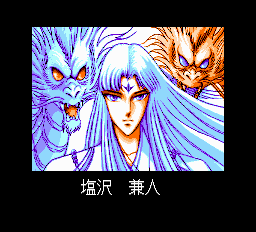 Clearly the game is inspired by the classic novel Nanso Satomi Hakkenden, which in turn is inspired by Water Margin. 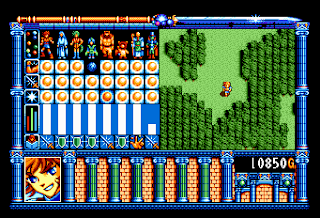 The idea is that eight heroes are called by magic orbs to save the world. 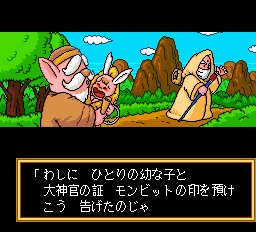 You play through introductory storylines with each hero (sort of like Dragon Quest IV), then they join together, get some special weapons, and beat one of the major enemies. 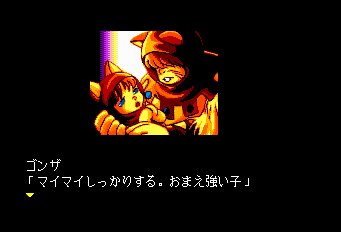 That's the end of the first game, and then in the second game the heroes will defeat the final boss. One reason why the Super Famicom version is so disliked is that it only has the first part of the story. 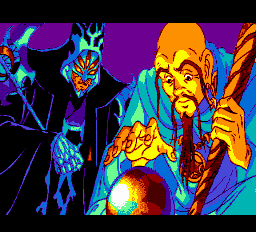 The opening scene tells you that Bido has summoned the power of the dark god Dal to gain control over the world of Giplos. 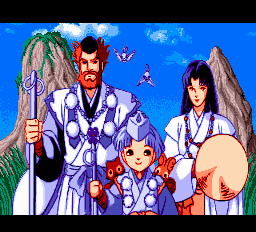 Some heroes manage to smuggle the last surviving child of the Giplos family out of the castle, who is the priestess of light. Bido sends assassins after her, but her guardians manage to sacrifice their life to make a barrier around the child, and send out eight gems to recruit chosen heroes to save her. In the PC version you could choose the order you played the stories, but in the console versions the order is fixed. 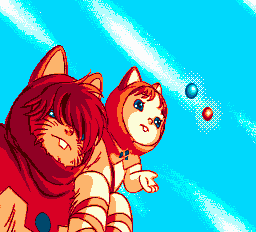 We start with Gonza and his younger sister Maimai. All of the stories proceed in basically the same way -- they're quite short but you have to do some levelling and grinding for money before going to the one town or dungeon, and then moving on to the next hero. 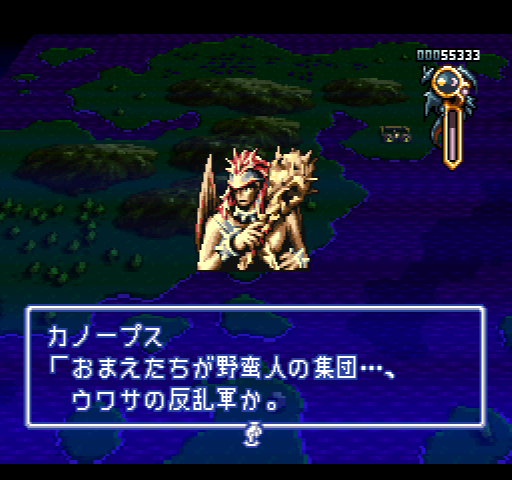 Most of the screen is taken up with static information; typical of PC games of the time to save memory. The game doesn't use a standard XP system. Instead, your stats seem to level up as you play. 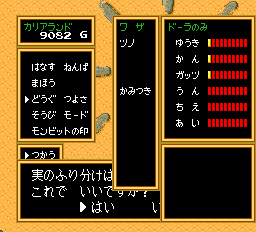 You can set one ability for the character to work on, which will then rise as you wander around and fight, but other stats level up seemingly at random (including HP and MP). I don't really like this -- just use a standard XP system rather than hiding the stats from the player. The equipment system is also strange. Weapons and armor don't have fixed stats; it depends on which character equips it -- if the character has an "affinity" with the weapon or armor it's better. Of course the game gives you no indication of who has good affinity with what weapon so you either have to use a walkthrough or save and load a lot. The battle system is your standard attack/defend/magic. One annoyance is that there's no inns. Instead you have to heal at a hospital which only heals some HP, or use items that frequently get dropped by enemies. This becomes really tedious once you get all 8 guys. Soon Maimai gets captured so Gonza goes after her. 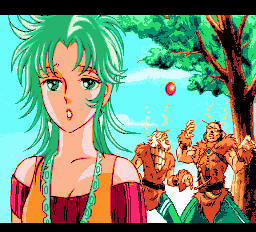 Maimai pretends to get killed to encourage Gonza to follow their destiny as the jewel heroes rather than going after their parents' killers. This part doesn't really make much sense. Each section is bookended by a fully voiced scene -- the speech is really fast and sometimes hard to understand. Apparently they had to speed up the dialogue to fit everything on the CD tracks (they play the speech directly off the CD rather than as files). Maboroshi Sakyo, an alien with two dragons who comes to visit the grave of his former lover, but has his strength drained by enemies. Kook Lo Tam, a 9 year old boy whose parents try to protect him but die. He befriends a bunch of animals. Alec Heston, an old hermit and fortuneteller who gets sent to the world of death by a rival and has to escape. Lillian Lancelot, a girl who can use needles to compel people to tell the truth. Her chapter involves solving a murder mystery. Zan Hayate, the leader of a pirate crew who is imprisoned for rebellion against Bido. He has to escape from prison. Romal Sebastian the 7th, the heir to a rich family who went to join the circus, but comes back to his house after the death of his father and has to defend the house against enemies. The sections have a nice variety of things to do so that it doesn't feel repetitive. After finishing all of these sections, the heroes unite and the rest of the game is finding legendary weapons for the people and then defeating Bido. 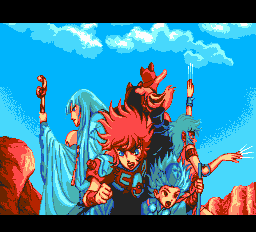 I stopped here though -- the story and characters are pretty entertaining but the gameplay is not very good. There's too much mandatory grinding, and money is too scarce and healing is too time-consuming (especially with 8 characters). I will try Burai II when it comes up though, to see if they improve on the system at all. Regarding the PCE games, my intention is to alternate back and forth between SFC and PCE until I catch up, and then play the PCE and SFC games chronologically. I will add in the PSX and Saturn games when I reach that point. However, I'm going to continue to follow the pattern of only giving the non-SFC games one week unless they're actually good games, whereas I will play the SFC games until the end unless I really have to abandon them. This is a busy week and I'll be out of town next weekend -- I'm going to try to make an Ogre Battle update tomorrow or Monday but then things could be irregular for a bit. Story/Characters: This is definitely a weak point in the game, which is perhaps not surprising given the non-linear, open style of the game. You have four team members -- your main character, a soldier, a mechanic, and a dog. They have brief backstories but once they join your party they never speak again, even in the ending. 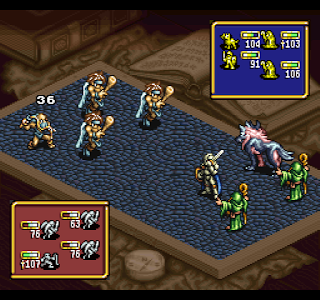 The enemy characters have more of a presence, and are on par for the detail given to characters in this era of RPGs. There is a story, although a lot of it has to be discovered through optional areas and talking to people. The basic idea is that the main character wants to get revenge on the Grappler group, and since they control most of the world that turns nicely into a "save the world" plot as well. World: The setting is post societal collapse, but not quite as "post-apocalyptic" as some settings. There are a lot of trees and water, and people don't seem to have lost the use of technology. There are a lot of interesting places to see and find. Game Flow: The game is described as non-linear and open world. In reality there are specific things you have to do to win the game that (mostly) have to be done in a fixed order. There just aren't that many of them, and in order to find out what they are and have enough power to defeat the bosses along the way, you have to do a lot of the optional things as well. For the most part the game proceeds smoothly. There's a lot to do so if you're stuck you can always explore around and see what's out there. A few of the choke points (where you have to do something specific to open up a new area) are somewhat unclear but as long as you explore everything you should be able to win without too many walkthrough lookups. My biggest complain in this area is that I think the final bosses are too difficult. Without knowing some tricks to beating them you are going to have to grind a lot of levels at the end of the game, and even with the tricks I still had to grind 10 levels and barely beat the second boss. What they should have done is make the final bosses reasonable difficulty, and then using the "monster hunting" system to have optional bosses that were more challenging. One minor annoyance is that the shops have very limited inventories so you have to take notes on where certain items are sold. And a lot of times the shops have no logos on them and there are multiple people in the shop selling different things, so this can add a lot of wasted time. System: This is an area I think they could have done better with. You can customize the tanks a lot, and playing with those upgrades can be a lot of fun. But once you're actually in battle, there's not that much you can do. It's basically attack or item. If you're in the tank there are some special bullets you can buy like "hollow shells" or "napalm shells" which give you some more options but not much. Side Quests/Optional Content: There's a large amount of optional content in the game -- wanted monsters to hunt, things you can buy to outfit your home, areas that aren't necessary to beat the game but give you backstory, tank customization, mini-games, and more. Interface: Overall this is pretty good. You can customize the interface a lot, assigning commands to all the buttons (including L and R, which very few RPGs up to now have used). There are also different battle options, including one that suppresses all the messages about what happened in the battle and has all the attacks happen at the same time, which speeds up grinding a lot. Overall I would rate this game as a solid Average for me, although if you really like non-linear stuff I can see upgrading it to Good. Has anyone played the DS remake? I'd be interested to hear if it addresses any of the issues I mentioned. 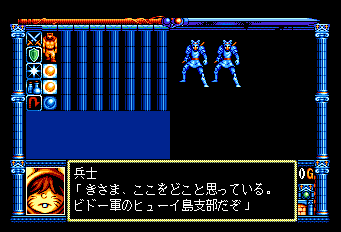 Next up is Burai for the PC Engine. 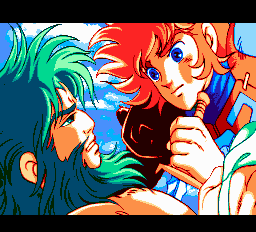 This is a game I skipped when it came up on the SFC rotation because the port was said to be so bad -- one big problem with it is that the PC game was released in two parts, and only the PC Engine had both parts ported. 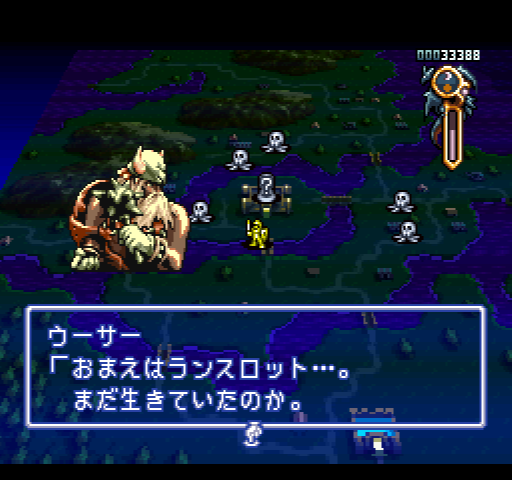 So the SFC version is basically half a game. Finally, yesterday was the one year anniversary of this blog. Thanks to everyone who's been reading and I hope I can keep it up for another year at least!